[Martin Stromer] made this great looking Hard Disk Clock about 12 years ago, and finally decided to share it with the world. It’s been “ticking” ever since. It’s a beautiful clock, and if you think the drive might look a bit odd, that’s probably because its well over 20 years old! We’re not too sure the capacity, but it couldn’t have been more than a few dozen megabytes. To read the time, the platter rotates 30 degrees at once, per hour. The read-write head inches across the disc to display the minutes. Each of the black lines represents a quarter hour. The whole thing is controlled by an ATMega16, which maintains almost all of the original hardware. The blog post has a great write-up on how it all works. Did we mention it’s also easy to set the time? Simply rotate the disc by hand and slide the read-write head into place, then press the reset button. Check out the clock in action after the break. [Jianan Li] just finished documenting one of his most recent projects, a wireless MIDI floor piano that he and a small group made for Duke University’s Hackathon! He was inspired to do this project after reading our recent coverage on a DIY Pressure Plate. Having only 24 hours to compete in the Hackathon, they had to choose something that was fairly easy to build out of cheap materials, and quick to assemble. This was just the ticket. The piano features 25 of the aluminum foil pressure plates, whose state are read by the Arduino Mega. This is then transmitted by an XBee radio to an Arduino Uno, which acts as the receiver for the laptop that processes the signals. They even added a remote control using an ATtiny85 to allow for octave and instrument changes — it also uses an XBee to communicate back to the Uno. For a 24 hour build, the quality is quite impressive, and it doesn’t sound half bad either — Take a listen after the break! Way back in April we looked at an impressive Pick and Place machine project which wasn’t actually up and running yet. Well it looks like [Brian Dorey] has really put the pedal to the metal with this fall, posting nine project updates since September. The previous system was working just fine but required quite a bit of user intervention to do the actual placing. So the first modifications toward the new goal centered around motorizing the gantry. There’s a lot of information on this, as well as the vacuum tweezer heads that were designed for the system. But for us it was exciting to read about the vibrating chip feeder. This uses the vibrating motor from an Xbox controller to jiggle the ICs from their tube packaging to a staging jig off the side of the build table. You can see a video of this after the break along with a demo of the entire machine at work. [Brian] seems to favor the Xbox parts as he also used an Xbox live camera along with OpenCV to detect the parts and ensure they are lined up correctly. For the best results possible the parts need to be illuminated properly which is why he also built a rather interesting light ring using 144 red LEDs. Let’s face it, most of the time we’re hacking for no other reason than sheer enjoyment. So we love to see hacks come about that can really make a difference in people’s lives. This time around it’s a video game designed to exercise your eyes. [James Blaha] has an eye condition called Strabismus which is commonly known as crossed-eye. The issue is that the muscles for each eye don’t coordinate with each other in the way they need to in order to produce three-dimensional vision. Recent research (linked in the reference section of [James’] post) suggests that special exercises may be able to train the eyes to work correctly. He’s been working on developing a video game to promote this type of training. As you can see above, the user (patient?) 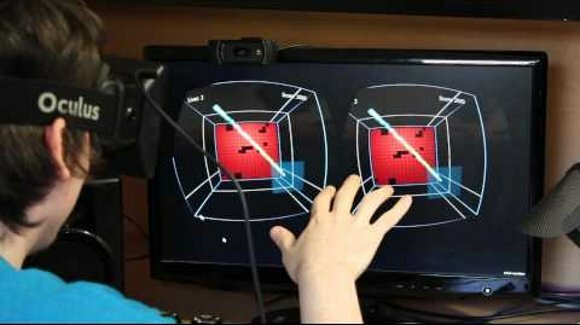 wears an Oculus Rift headset which makes it possible to show each eye slightly different images, while using a Leap Motion controller for VR interaction. If designed correctly, and paired with the addictive qualities of games, this my be just what the doctor ordered. You know what they say, practice makes perfect! [DoctorBeet] noticed the advertisements on the landing screen of his new LG smart television and started wondering about tracking. His curiosity got the better of him when he came across a promotional video aimed at advertisers that boasts about the information gathered from people who use these TVs. He decided to sniff the web traffic. If what he discovered is accurate, there is an invasive amount of data being collect by this hardware. To make matters worse, his testing showed that even if the user switches the “Collection of watching info” menu item to off it doesn’t stop the data from being phoned home. The findings start off rather innocuous, with the channel name and a unique ID being transmitted every time you change the station. Based on when the server receives the packets a description of your schedule and preferred content can be put together. This appears to be sent as plain data without any type of encryption or obfuscation. Things get a lot more interesting when he discovers that filenames from a USB drive connected to the television are being broadcast as well. The server address they’re being sent to is a dead link — which makes us think this is some type of debugging step that was left in the production firmware — but it is still a rather sizable blunder when it comes to personal privacy. If you have one of these televisions [DoctorBeet] has a preliminary list of URLs to block with your router in order to help safeguard your privacy. [Dan] has come up with a novel solution to the age old problem of keeping your grocery list up to date. He’s added a bar code scanner and a Raspberry Pi under a kitchen cabinet. He calls the system “Oscar”, though we don’t see any grouchiness in his trash can. When [Dan] runs out of a product, he simply throws it away. Just above his garbage and recycling bin is a low cost barcode scanner. [Dan] holds the item until the scanner reads, then sends it on it’s way to recycling or the landfill. The decoded bar code is processed by a Raspberry Pi also hiding under the cabinet. The Raspberry Pi sends the data to Trello.comusing the Trello api. If a product isn’t recognized by Trello’s database, trello dispatches a text message to [Dan’s] phone. He can then add the product information via a web interface. We think the user interface is what’s great here. Once products are in the database, the only thing that has to be done day to day is pause for a moment before throwing a package away. [Dan] has all his code up on github, and has also created a reddit thread for Oscar.